Long time no beauty posts, am I right? I feel like my blog has slowly been gravitating more towards the lifestyle side of things, but I still love all things beauty, so I'll be sure not to forget to throw in beauty posts! 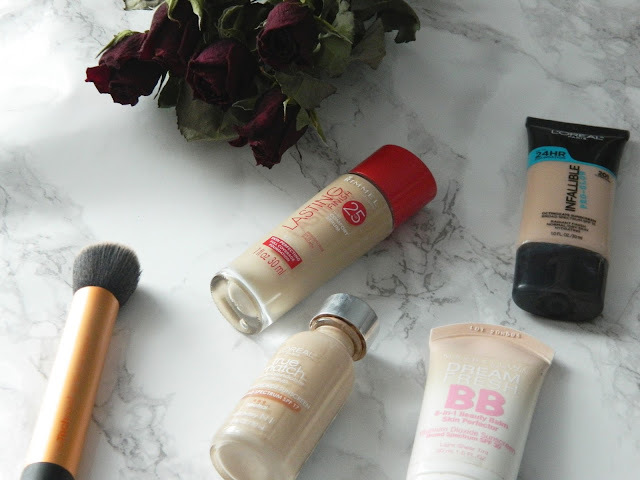 Today I wanted to share my favorite foundations from the drugstore. 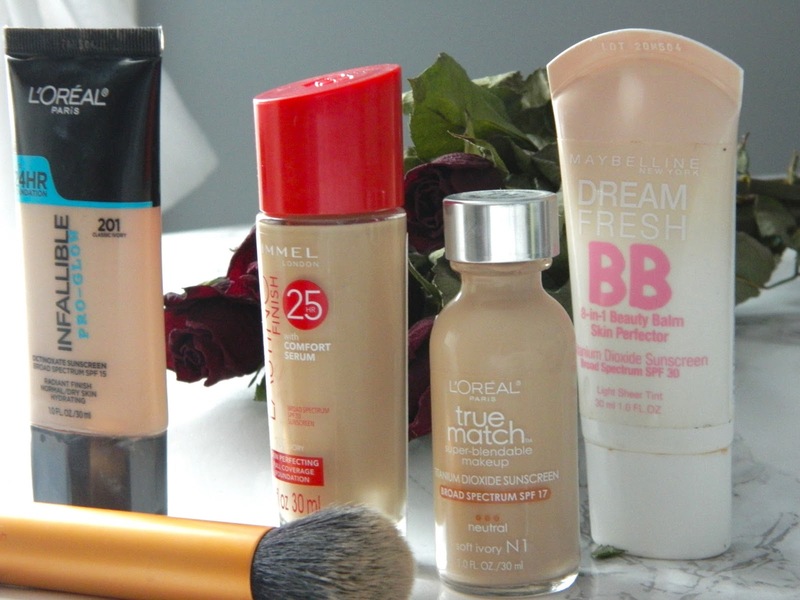 When it comes to foundations, the drugstore has some AMAZING options. On a day to day basis, I almost always use drugstore foundations/BB creams. 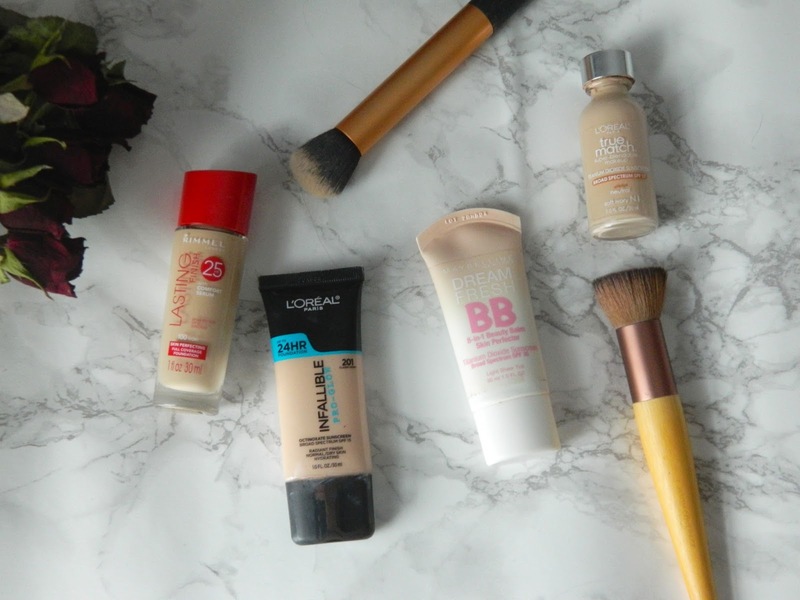 Although there are some high end foundations I love as well, I really believe that you don't have to spend a lot of money to get a good foundation. This is my favorite drugstore foundation, for sure. From the first time I tried it, I've been in love with the texture and the gorgeous finish that it provides. I would say the coverage is sheer, but it can definitely be built up the medium. I prefer lighter coverage foundations, just because I like the natural look. This foundation is super blendable, and applies beautifully with this brush or a beauty sponge. It gives your skin a gorgeous glow throughout the day, without making you look oily. I would say it's the perfect balance between a satin finish and a luminous finish. While this foundation might be better for gals with more normal to dry skin, it isn't too luminous for oily skinned gals. My skin tends to be dry to normal during the winter months, and a bit more oily in the summer. I wore it throughout the summer and it was the perfect summer foundation! I've also been wearing it this winter, and it's still amazing. This foundation is a total classic, and looks amazing on all skin types. It provides about a medium coverage, but another layer or so can build it up to full coverage. I decided I had to try this foundation awhile ago after hearing such great things about it on YouTube and from friends. I finally cracked and bought it (in the lightest shade as usual...) and fell in love! It's the perfect everyday foundation, but I love how buildable it is, so it's perfect for fancier occasions when you might want a more full coverage look. 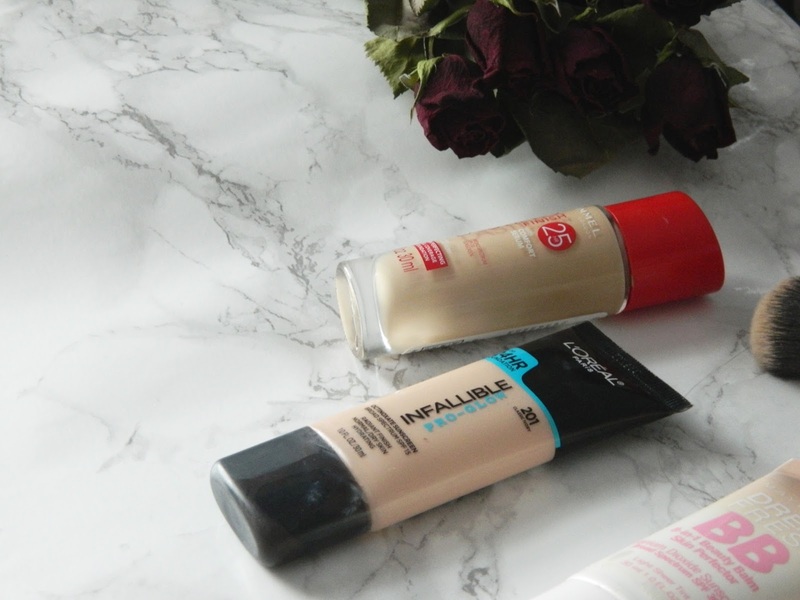 This foundation is a fairly new discovery for me, but so far, I'm really, really impressed. You can make this foundation full coverage for sure. I must admit, it does have a bit of a scent to it. If that's something that bothers you, definitely consider that before purchasing. The only time I can smell it, however, is when I'm applying it. Once it's actually on my skin, I can't smell it at all, so it doesn't bother me! Also, like the L'Oreal True Match Foundation, it doesn't have a pump. I like this foundation so much that I'm able to look past the scent and the lack of pump. It leaves you skin looking flawless yet natural. I thought this BB cream deserved an honorary mention, since it isn't really a foundation. I love BB creams for everyday wear though, since they have a very sheer coverage, but smooth over imperfections. I use this on a daily basis when I just want to even out my skin tone and throw on some mascara! If you're looking for a drugstore BB cream to add to your collection, this is definitely the one! 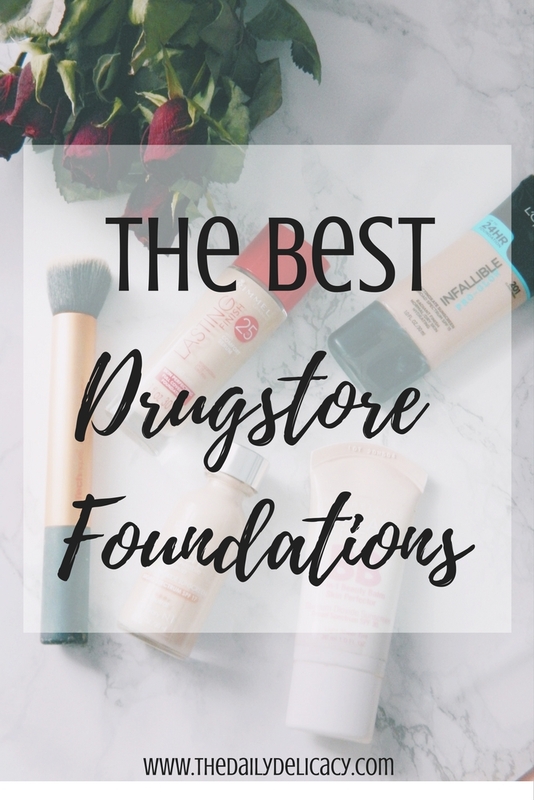 What are your favorite drugstore foundations? Let me know so I can try out your suggestions! 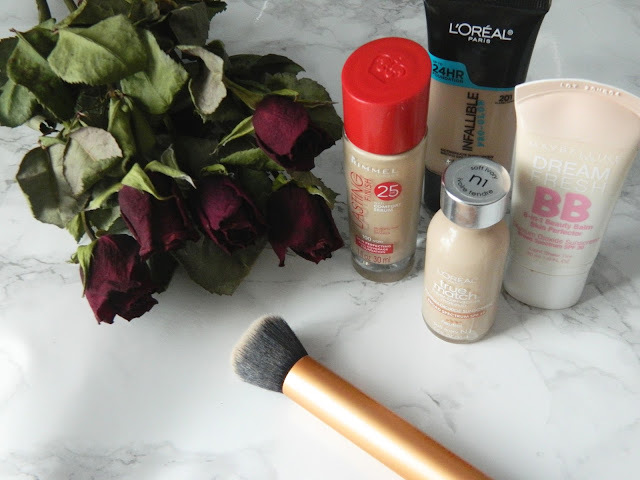 I like a lot of L'oreals true match line but for some reason I don't think I've tried the foundation yet! I haven't tried anything from the True Match line other than the foundations.. is anything else good? :) I've heard great things about the concealer! Ahh thank you soo much for this post! I'm currently using the Maybelline matte & poreless, and I actually really like it. It is a light-medium coverage foundation, which is perfect for me since I wear it to school and don't want it to look heavy. The packaging feels wonderful, but it doesn't have a pump which means you need to physically shake it to get the product out. I feel like it has decent staying power, but I'll definitely consider these suggestions. They all seem like great products! Thank you for sharing!